Get ready for some incredible wins with Wolf on Win Street, an exciting stock market themed game created by Core Gaming. Wolf on Win Street is based on the popular Wolf of Wall Street film with hilarious cartoon graphics. 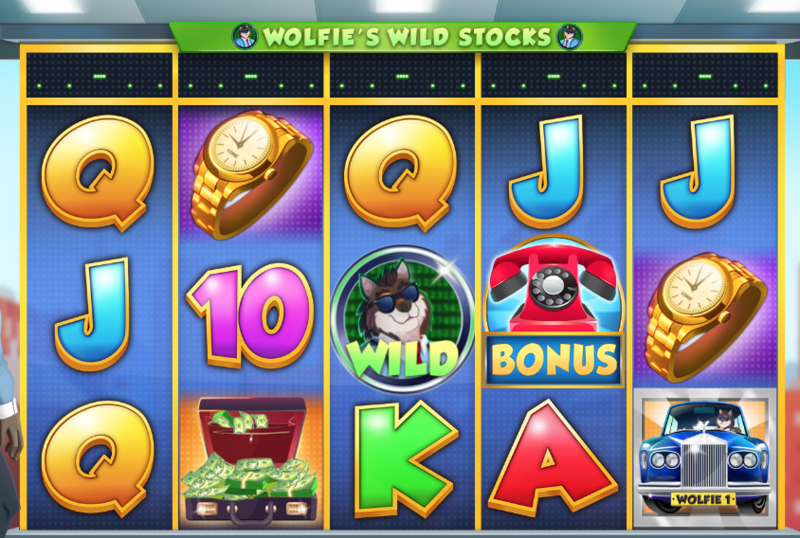 The suave looking cartoon wolf is the star of this 5 reel, 20 payline slot. This slot can be played on all devices including your mobile, desktop and tablet and you can bet from as little as 20p per spin. The highlights of this slot are the 5 different reel modifiers and the many free spins up for grabs. Wolf on Win Street is a fun slot with a Wolf of Wall Street theme. If you're a fan of the film, then you'll enjoy this slot! The graphics are amusing with fun wolf characters dressed in smart suits and a tie. Behind the reels, you'll see scenes of a busy New York office. Several telephones and computers can be seen on the desks that have a view overlooking tall office buildings. Symbols include a fancy Rolls Royce, a case full of cash, a red telephone, and an expensive watch. The Wild Symbol - The wild symbols in this slot is the wolf. The wolf replaces all other symbols apart from the scatter to form winning combinations. 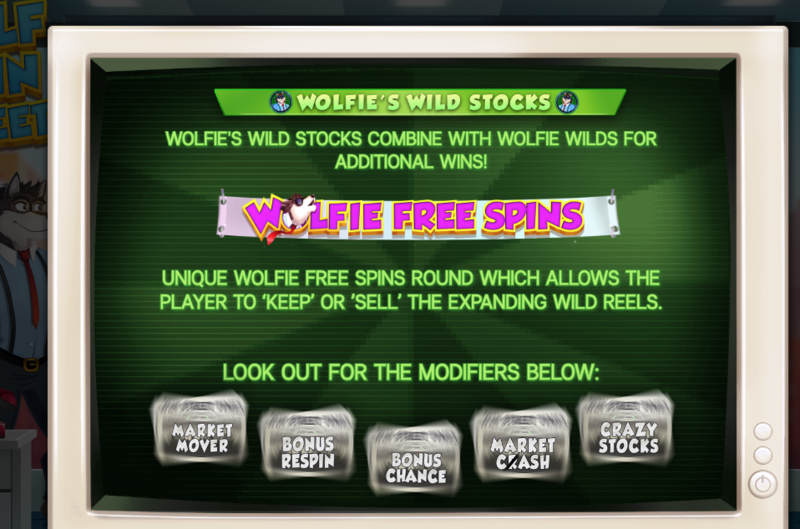 Wolfie's Wild Stocks Feature - The stock market ticker is displayed at the top of the reel. Throughout the game, you'll see the ticker flash with blanks, bonuses, and multipliers. Unlock one of these exciting prizes by landing a wild. Base Game Modifiers - This feature is activated randomly during gameplay. The handsome wolf will get up to answer the phone when it rings. When he does this, you'll be given one of the following games: market mover feature, market crash feature, crazy stocks feature, bonus feature and bonus respin feature. Wolfie's Free Spins - Land 3 or more telephone scatters to activate Wolfie's free spins. Land 3 scatters to win a 5x multiplier and 6 free spins. Land 4 scatters to win a 7x multiplier and 7 free spins. Land 5 scatters to win a 10x multiplier and 8 free spins. If you're a fan of the hit movie Wolf of Wall Street then you'll enjoy this slot. Wolf on Win Street has a fun theme with cool graphics and entertaining features. There are lots of free spins and multipliers on offer, so this is one you won't want to miss!